CATBALOGAN CITY – Special Assistant to the President (SAP) Secretary Christopher Lawrence “Bong” Go today assured the Armed Forces of the Philippines (AFP) of President Rodrigo Duterte’s full support. Visiting this city for the celebration of Samar Day, Go went to the Camp Lukban Station Hospital to personally check on the condition of three soldiers who had been wounded in action. 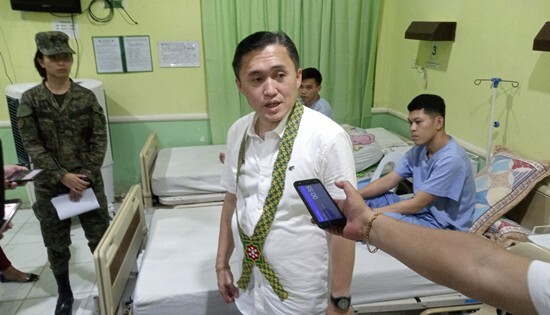 He said he will extend help if the three soldiers need to continue treatment in Manila. “Anything that they need in Manila, the government is willing to help them,” he said. When Go asked hospital doctor Captain Nikaelle Guevara what the Camp Lukban Station Hospital needs, the latter replied that they need an x-ray machine as well as new hospital mattresses. “You write us a letter, then I will immediately follow it up,” Go said. He said this is in line with President Duterte’s commitment to support the AFP fully. “‘Do not worry, full support ko kayo,’” Go quoted Duterte as saying.